What’s Wrong With Having Dark Skin? What's wrong with dark skin? 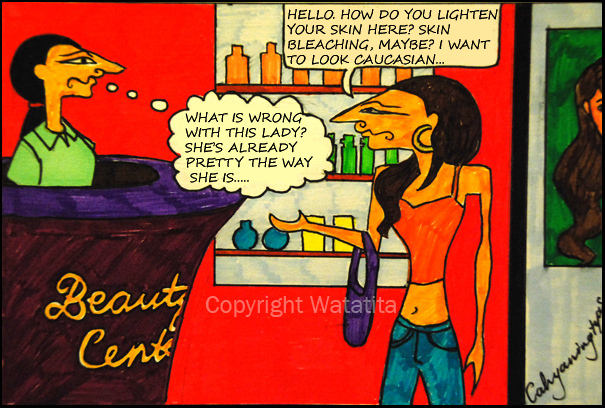 Many Indonesian women desire light skin, even though naturally most of us are born with dark skin, and I don’t know why – but it’s been viewed as something.. well.. unattractive. Why does the Indonesian society prefer light skin? Why do we want to look Caucasian? This might sound really weird to Westerners, they want to have our exotic dark skin! Besides, having dark skin means we have less chances to get skin cancer. I’m used to being teased when I was younger, because my skin is quite dark compared to many other Indonesian women (especially those who live in the big cities)… but it didn’t affect me at all. I’m proud of my dark skin. I am Javanese, and so I should have dark skin. It’s a part of my identity. Be proud of your skin colour, you are born with it!